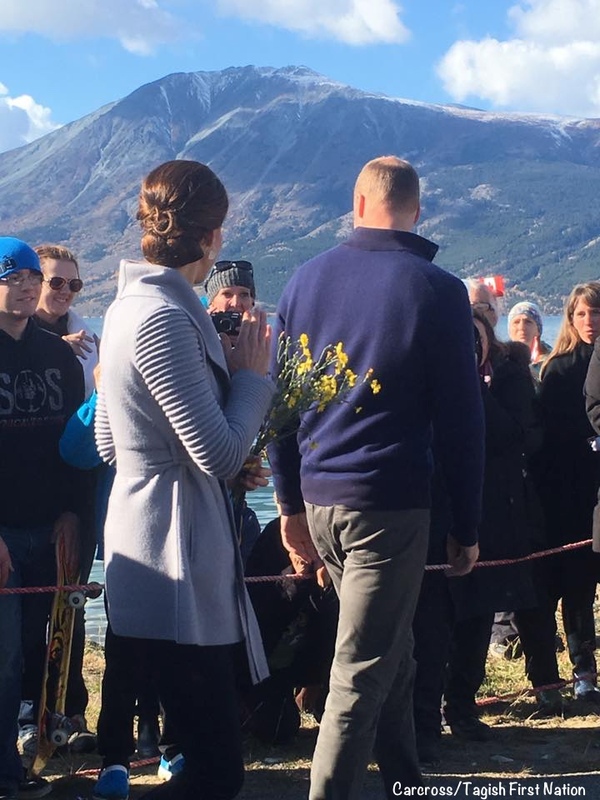 After their morning in Whitehorse Kate and William did a quick clothing change and headed to Carcross, a town of less than 300 residents. 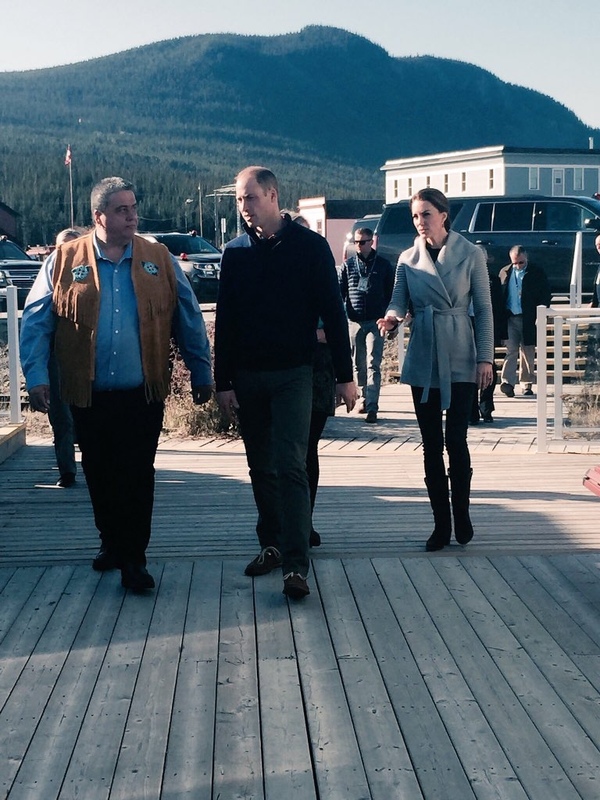 Above left you see Andy Carvill, Khà Shâde Héni (chief) of the Carcross/Tagish First Nation, greeting the royals. The community is located on the renowned Klondike Highway, and the scenery was spectacular. 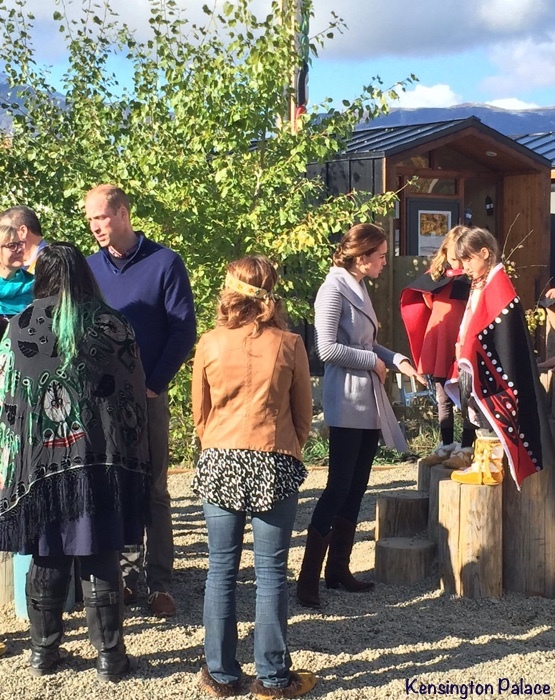 The royals were greeted with a traditional welcome from the Carcross/Tagish First Nation at Carcross Commons. 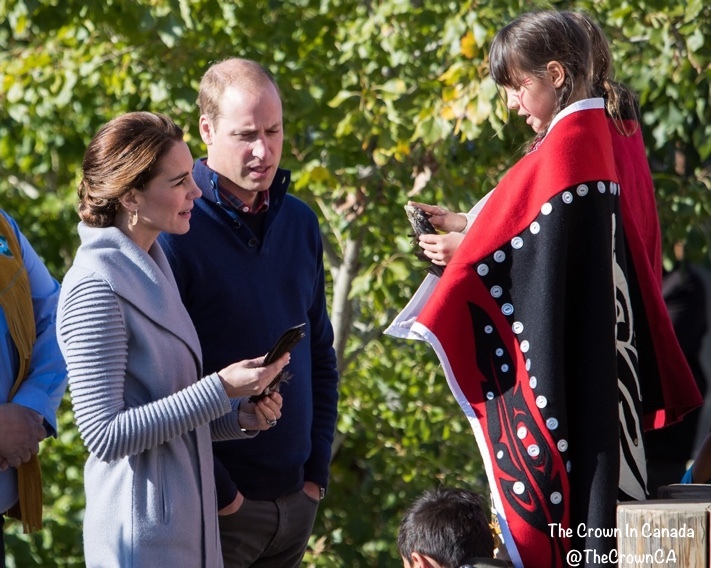 The Duke and Duchess clapped and cheered as they experienced a colourful ceremonial welcome beneath an elaborately carved totem pole by the local First Nations community. 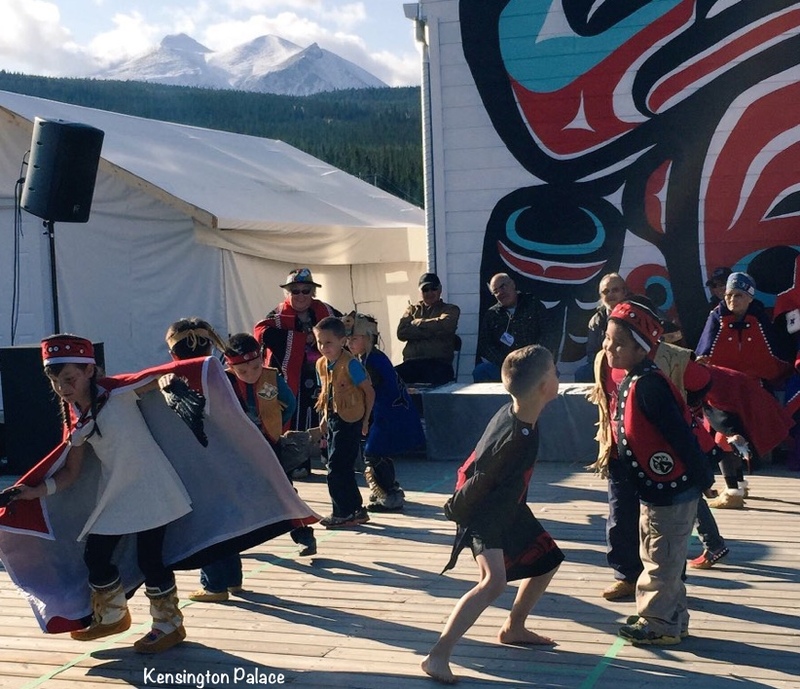 They were particularly captivated by a group of tiny Tagish dancers, local children aged between four and seven, dressed in traditional cloaks and headdresses, demonstrating their’ Raven’ and ‘Wolf’ dances. Kate and William chatting with some of the children. The little girl in red and black is named Oksana, and she presented William and Kate with an eagle feather. 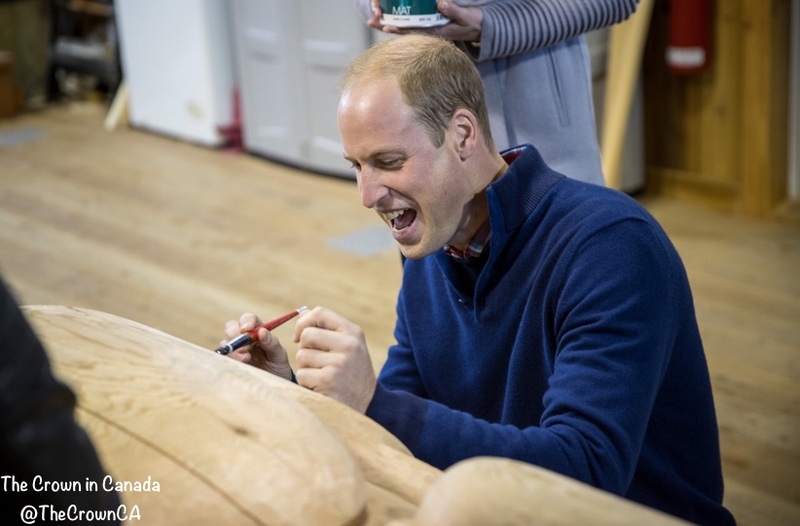 Smarch showed William and Kate how he practices his craft, and even put the couple to work painting a 35-foot totem pole. Kate and William getting ready to add their own touch. Each painted a portion of the totem. William looked rather fierce as he attacked his task. 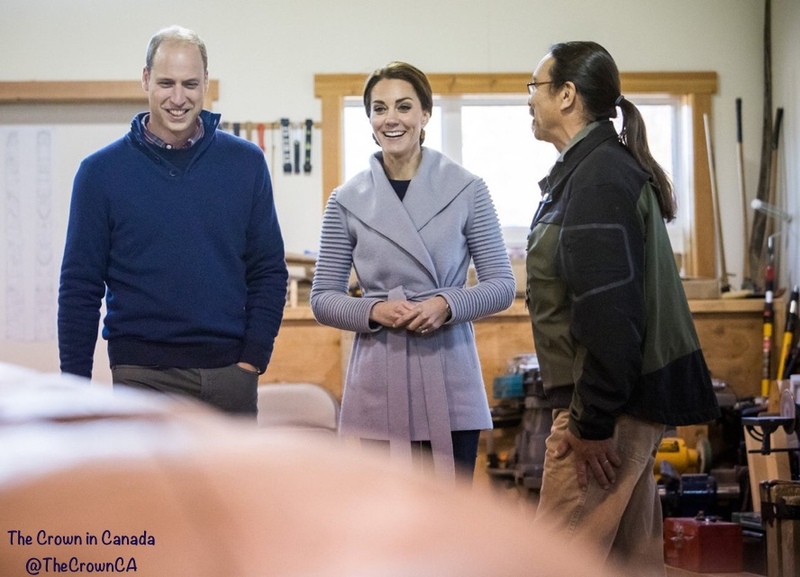 The local craftsman also took the opportunity to send his regards to William’s father, Prince Charles, who received a carved mask from Smarch during his visit to the Yukon in 2001. 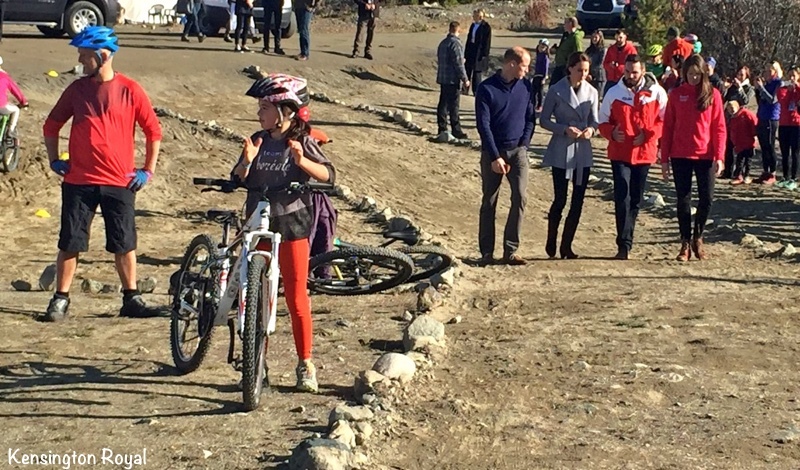 The Duke and Duchess then traveled to Montana Mountain to watch mountain bike training and meet local families. 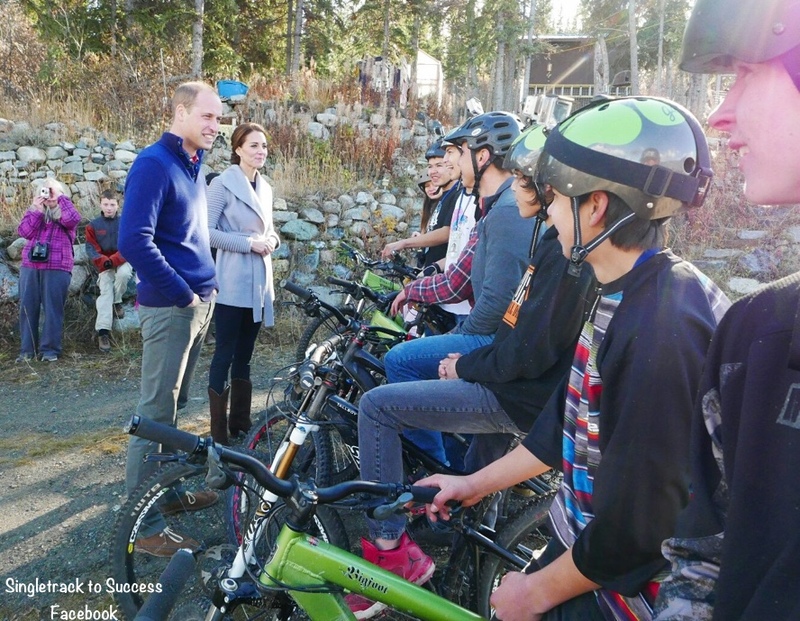 While there, they learn learned about the Single Track to Success Project, an initiative aimed at engaging the Yukon’s First Nation youth in trail building and mountain biking to promote health and wellness and restore a connection to the ancestral lands. After hearing how his grandparents had travelled in the last carriage on the train, which was specially fitted out with a marble table for their 1959 visit, William gallantly helped his wife climb back down onto the tracks and they sidestepped along to the front of the engine. 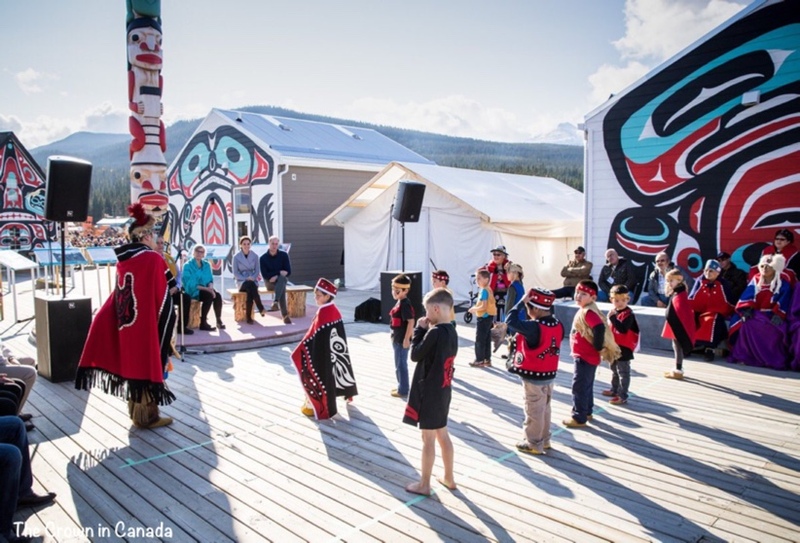 Their host in Carcross, Chief Andy Carvill, 52, explained: “The Duke asked if he could go in and they got inside the train and blew the steam whistle. It’s time for a look at what Kate wore. 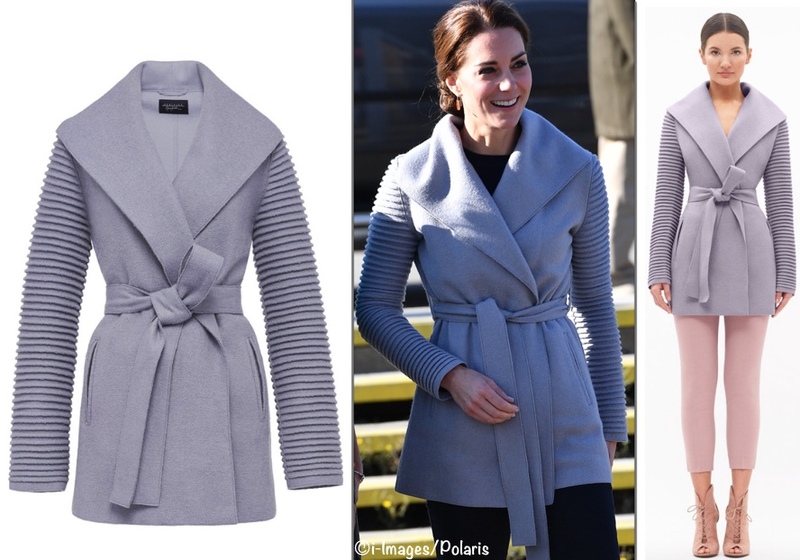 We begin with her Wrap Coat with Ribbed Sleeves from Canada’s Sentaler brand. The piece has a shawl collar, slit pockets, belt. The ribbed sleeves are a signature look for the company. It is made of 60% superfine alpaca / 40% wool, and sells for $920. Sophie Gregoire Trudeau is fond of Sentaler and wears the brand with some frequency. The Duchess was in a pair of boots we have seen her wear before in Canada. 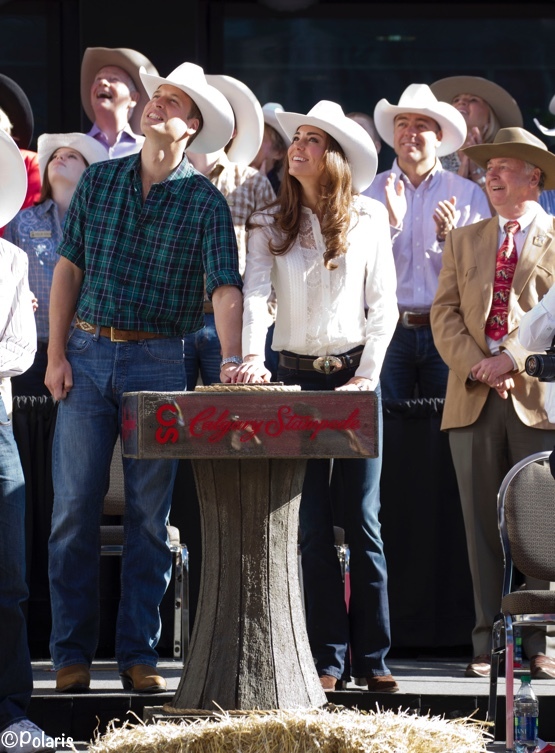 You can just see them on Kate in this picture from the 2011 Calgary Stampede. The boots are by R. Soles. “It’s a different pair – the design is the same but the heel height is higher,” R.Soles designer Judy Rothchild tells PEOPLE, adding that Kate’s $385 Virgi Chocolate Suede handmade boots completely sold out overnight, mainly to customers in the U.K and the U.S. The suede-and-leather style, which has a nearly three-inch heel, is now on an eight-week waiting list. 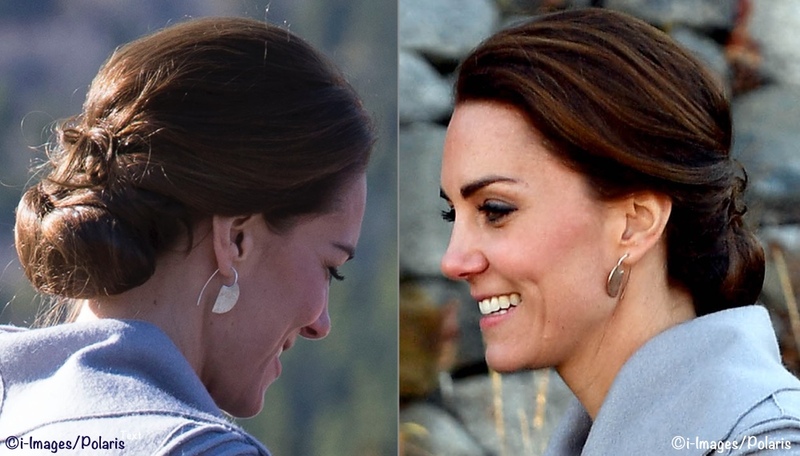 Kate wore new earrings from another Canadian designer, Shelley MacDonald. 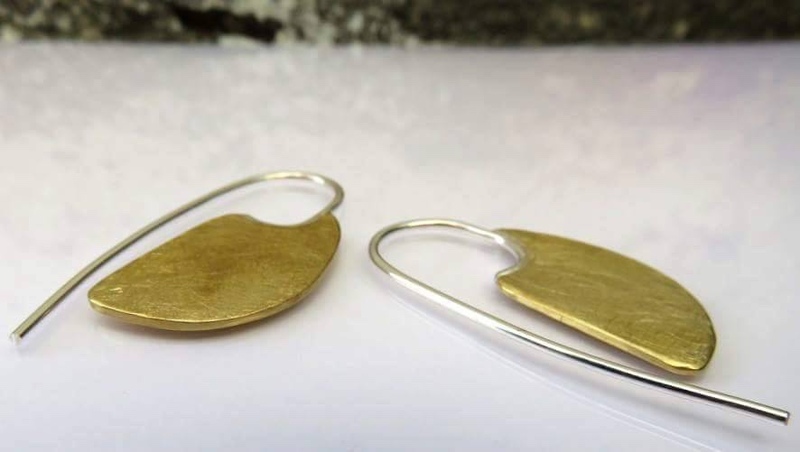 The earrings are the Large Bronze Ulu style, available on the designer’s etsy site ($73.96). They are also offered in a smaller size, as well as in sterling silver. What also sets her apart is her age. At 28, she’s the youngest full-time goldsmith in Whitehorse. She paid her dues and worked diligently throughout six years of studies in jewelry design and metalsmithing at the Nova Scotia College of Art and Design. Kate and William then flew back to Victoria to be reunited with George and Charlotte, in advance of tomorrow’s children’s party at Government House. 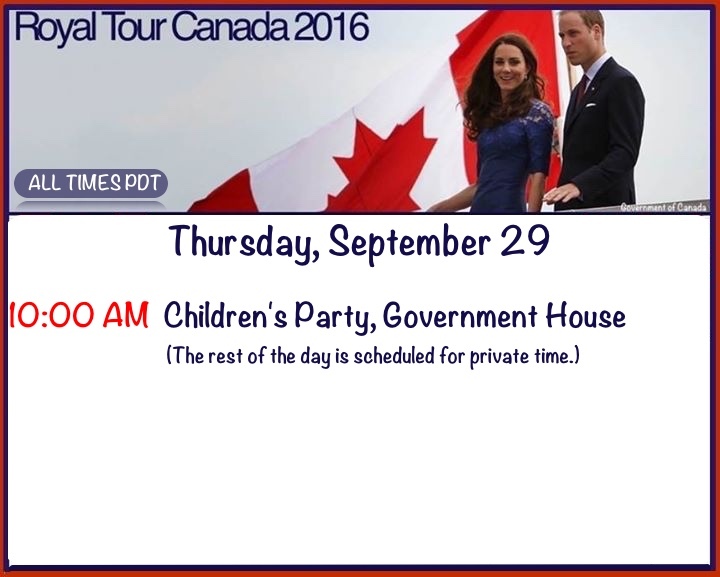 We’ll see you tomorrow for an event many of us have been looking forward to, the children’s party. The sweater looks very plush, and love the boots! I really appreciate the beauty of a well-crafted boot, they will last forever and if you found a pair that feels snug, very comfortable. I am of the opinion that artisanal cowboy boots are now more urban than rural, and very confused at the opinion that they are trashy. I think, for those of us who don’t associate with boot-wearing trashy people, we will not be able to understand this association of cowboy boots as trashy. 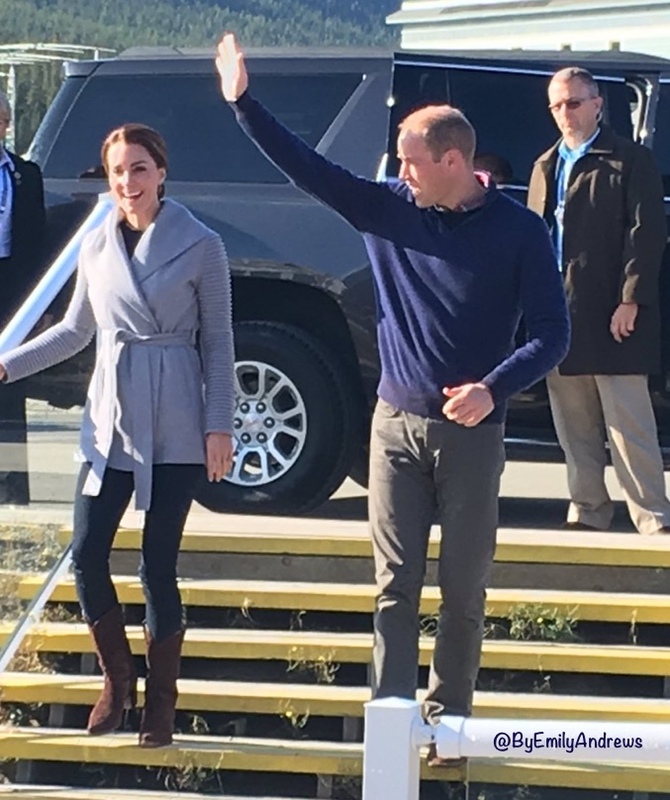 Interestingly, the Duchess has got a snuggly cool weather southern California vibe happening, right down to the skinnies tucked into those boots. She’d be right at home in Marin or Malibu. As a long time reader, I’m a bit surprised at all the comments judging cowboy boots to be trash or country something or just not conventional enough for their tastes. Whatever has provoked this sartorial ire, I think I’ll go back to reading the posts and skip the comments. Thanks, admin, for your ongoing wkw posts! Very nice casual look for the Duchess ! I love her sweater coat, the color is great and I think it is adaptated with the landscape colour. Also it seems really warm and comfortable, I would love to wear it ! Though I’m not a huge fan of the earrings, I think it’s a nice choice to wear a Canadian designer during the trip. I really like this look – didn’t like the ribbed sleeves at first but they grew on me. Is it really a jacket/coat, it looks beautifully soft & fairly thin, more like a cardigan. I think I prefer pink as I am a pink person but the dove grey is gorgeous too, sigh, I wish. I have stroked alpaca in wildlife centres though & found their coat quite coarse so don’t know what different breeds are used for wools (as opposed to all baby goats are meltingly soft). Why. Is. She. Wearing. Cowboy. Boots. I’m truly confounded, as these are just awful and frankly, look quite trailer trash with such a beautiful coat (I have the same coat in pink and for anyone interested, Sentaler’s alpaca coats are quite lightweight, yet very warm). 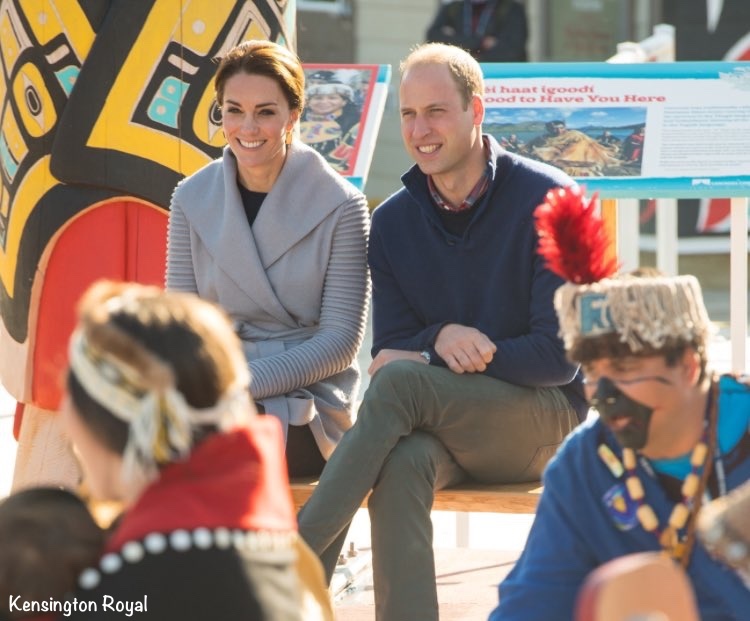 I see that The Duchess is wearing the same boots in Haida Gwai today, which is a real shame… Not sure who suggested that these were a good look…. I am a proud Canadian, and as an FYI to anyone looking at these and thinking that they may be a sartorial nod, we Canadians are all truly confused. Most Canadians wouldn’t be caught dead in boots like this, other than if attending the Calgary stampede, or as a silly joke at a country and western bar. The overall outfit is great – as with today’s Smythe les Vestes blazer – but when she lugged the Penelope Chilvers boots all this way, why wouldn’t she opt for those instead? Someone needs to take those boots away, as other than that, this tour has really been a successful one for her in terms of style, colour, cut and pushing the boundaries. Speak for your self. I’m a proud Canadian and I live in my boots year round, without the excuse of working on a farm or riding. They are comfortable and pair well with just about any outfit. The boots look wonderful with her outfit, toning it down for a casual day out. She’s outdoors, walking around and visiting all day, not sitting in a conference room – Kate doesn’t need to be decked out all the time. She looks fashionable and comfortable, and her outfit is very appropriate for the day’s activities. Yikes!! Sorry, Kay – I’d have to agree with Victoria….the boots are awful and dare I say, trashy? Also a Canadian and would never consider those to be appropriate….I think they look rather costume-y, as with other comments to this post. The only place these boots belong is, as you’ve said, on a working farm or perhaps, riding, although they make far nicer boots to wear when horseback riding. I think the true test is whether or not we’ll ever see Kate in these boots again (my guess would be that that is a resounding ‘no!’ and that she’s really just been mislead in this particular choice). I agree with other readers on the cut of her jeans….skinny jeans are sort of out, aren’t they? Just as they’re a trend that came into fashion, I think it’s time to retire the skin tight everything…I remember when you couldn’t buy anything but skinnies, and now it seems as though all of the jean manufacturers and designers are offering plenty of bootcut options….so definitely time for Kate to try a new look. Plus, she looks lovely in bootcut jeans and can really pull anything off with her figure. Imagine if she were to try something wide-leg, which she could totally pull off since she’s quite tall I think. All in al, a nice look – although I agree with the majority on this one. You’re not at a rodeo, so get rid of the boots! I am proud to be an American and wear my western boots quite often. Nothing “trashy” about them. I like this. I had to take a minute to decide if the ribbing on the arms works… but I think it does. The sweater seems cozy, and the entire look is casual without being unsophisticated. Thank you for updating the part about the boots….as a regular wearer of “cowgirl” boots (which, as an aside, are more comfortable than my running shoes) I could tell upon first glance that these were not the same pair from her previous Canada tour, but I am NOT a fashion expert by any means, and definitely didn’t want to sound like I was correcting anyone far more knowledgeable than me! 🙂 I love these boots, I love the coat-sweater, but I’m not sure these two pieces work well together. I’m with others who’ve said that a cute pair of booties might have worked with the coat better, or that a boot-cut pair of jeans would have been great with the boots….in either case, different top or bottom should have been considered…..at least, in my extremely humble fashion opinion. And I say this, as always, with the caveat that the Duchess looks just beautiful, happy and relaxed – what a wonderful tour this has been for her sweet family. I am clearly in the minority, but this is one of my least favorite looks of hers. The sweater jacket is just beautiful, but the jeans are so tight they look like leggings-tho the look is better on the Duchess than the model pictured. The boots are also beautiful, but the colors are all over the board. Would have preferred hair down, but as other mentioned, may have been a time crunch issue. Earrings are very cool. The sweater/jacket. Love the sleeves, they make the piece, and her arms are thin enough to carry it off. Not a fan of the colour which is pretty washed out, but might have looked better worn against colours that gave it some life. I think the big shawl colour and belt tie make it look, as someone else said, like a bathrobe. Could have been a proper sweater coat or cardigan and would have looked great. Also loved the earrings which are much younger and more modern than Kate usually wears. Also glad to see the hair back. Again, as someone else pointed out, with colour and sleeves like that, her hair down would have been a disaster. But, I find the low bun too fussy and elegant for the casual leggings and esp. cowboy boots and the event. A high ponytail would have been younger, more fun and much more suitable. But the outfit as a whole isn’t pulled together properly. Mainly its the cowboy boots which are the wrong colour for this outfit and the wrong look for a sweater like this. Cowboy boots, worn by non-working cowboys, can look like an affectation, esp with leggings as worn here. I think if going to wear them, either with boot cut jean as she did on the last visit, or with leggings and short straight skirt as you would with other tall boots. Overall, much better than the disastrous India trip, but if you compare the two Canadian trips, I don’t think her overall style has improved. There were a lot of gorgeous looks on that trip. How was the India trip disastrous? Did something happen that I or others don’t know about? I’m just asking because we should all be careful from making far-fetched or far-flung comments, in other words, comments without evidence to support them. And I would say that in the India trip the Duchess had more homeruns in outfits than in this trip. They were: 1) the light green Desdemona dress to visit Prime Minister Modi, 2) the Jenny Packham sapphire gown, 3) the Naeem Khan dress for the Taj Mahal visit, the casual look for the hike to Tiger’s Nest, and 4) the Poppy print Beulah gown for Bhutan reception. So then, how was it disastrous? In the pictures were Kate is photographed against the backdrop of rocks and stone-coved slopes, the color of the jacket echoes the color of the stones/rocks perfectly. The coat looks so cozy, I love it. I guess the boots work because she’s in rural Canada. I don’t really understand why she only wears skinny pants and jeans. I think boot cut jeans would’ve been a better choice. Her hair was fine, if it was down the large collar on the coat would’ve reeked havoc with it. She looks great – very modern choices. Hairdo is great, earrings make a really nice change from her usual pearl/gemstone drop earring. Boots and jeans very appropriate and the jacket adds just the right amount of interest. Her choices are so much more grown up than her first visit – she looks really good. Can’t we get an update on the actual color of the sweater or what the maker calls it anyway? HAHAHA Not really a help, right! But thanks anyway. Sweater coats! I love sweater coats! The one she is wearing looks really really warm. Plus, plus, guys, Kate surfs Etsy! I really love Etsy because you can connect with so many different independent artists and support them. While I don’t wear super dangly earrings like the ones Kate is wearing (they can get caught in my helmet when I’m riding or my nephew will try ripping them off my ears), Shelley MacDonald has some other really cute earring designs. Thank you, Kate, for pointing me to a new jewelry artist. I shall now pay homage. Cowboy boots with jeans would have looked better. Not sure why she tucks her leggings? pants? into boots, but it looks a bit silly. Loved her hair–nice to see her lovely face. Does anyone know if we know where the jeans are from today as well as the ones she wore with the blue sweater? I think they’re so cute! I like the outfit, but the belt makes it look like a bathrobe. LOVE this coat!!! Anyone knows if there is a cheaper version of this coat? Love everything about look! Kate’s a marvel to have two small children and always look so put together wherever she is. So glad that she recognizes the value of spending time enjoying her surroundings and, even though she must change her outfit, not worrying with changing her hair. I’m curious as to the mix of commenters who either love the brown boots or don’t like the brown/navy/gray mix. My mother always told me that as a brown-haired, brown-eyed woman, I could wear brown shoes/boots with anything, and personally, I think she’s right. So here’s my query: How many commenters who like the brown boots with this outfit are brunettes? And conversely, of those who would prefer black footwear, are you not brunette? I’m brunette and fully support the boots! Brown boots go with anything. I have mousey-brown hair and brown is my go-to colour for boots! I am blonde and blue-eyed and love the brown boots, I wear them myself. I much prefer dark brown to black. Loved it! with her hair down, it would have been even better. I think these up-does make her look older and matronly EXCEPT when she wears a hat and then she is really stunning. I love this jacket, especially the sleeve detail and don’t think it looks too bulky. Chunky, yes, but not bulky. Chunky not a bad thing. Since the jeans look black to me, I do think it would have looked better with black boots too. Or fun red ones! But overall, this is another good look IMO. This look is perfect! She looks wonderful and it suits the situation. The sweater material looks incredibly decadent. Thoughtful touch with the earings. Boots are amazing. As a side note, the flowers on these Northern stops have added to the looks. The first were autumnal colours, the second wild flowers. I think alpaca has a better pedigree than merely decadent — hope you won’t mind my saying! It’s actually as tough as old boots and can last a lifetime. It can squash into hand luggage and come out just fine at the end of a trip, as well as having — along with cashmere – the wonderful advantage of being both lightweight and warm. And yes, I have quite a bit of it myself, my father once worked in Peru for a while and came home loaded with blankets, jumpers, poncho — you name it ! A well-made alpaca, especially, I think is on par with the best cashmere, if not better (as usually quite thicker). Perfect outfit for the occasion. I love that they’re spending time with indigenous peoples. I like this sweater coat in theory but it does look bulky on her, and the brown cowboy boots with it is just a jumbled up look for me. Tall, sleek flat boots would have been a more sophisticated choice. Interesting engagement though. This whole look is perfection! The hair away from her face, the shawl collar on the coat. The modern earrings. The brown suede boots. There isn’t a single thing I dislike. This is the most situation age appropriate thing I’ve seen her wear and she still looks amazing, modern and fresh. I take real issue with the fact that these separate pieces, while lovely by themselves, don’t match! Grey, navy blue, and brown don’t go together! Even black trousers would have been better. But I love the sweater, and her hair contributes to a casual, but polished look. I agree! I think the boots look great with skinny jeans. A modern style that looks great with the sweater coat! I wouldn’t change a thing! I think gray is really a neutral nowadays, so I think the colours look great together. The look is balanced with the skinny jeans. Boot cut jeans would have really look out of proportion…A chunky sweater on top and skinny on bottom– I think it’s almost perfect! The boots needed to be higher–then, it would have been perfect! Why does everything have to “match”? Mix it up a bit for goodness sakes. The coat has quite a wide shawl collar, so comfy-looking. I hope Kate wears more from this brand some time. Good idea to have the hair neat and away, if climbing around a steam train (I guess there wasn’t time to change the style anyway) – and we can see the earrings better! Thank you again for the excellent coverage. Lovely, cozy outfit for a casual setting I a cool climate. They look like they’re having a grand time. I’m curious about so many updos on this tour … ! Wonder what the motive is, perhaps there’s a lot of fog/humidity and it’s easier to keep her hair looking after she lost her styling the other day in the drizzle? Her security detail must have had a fit when she and William crept along the edge of the railway like that! This is a fine look for an outside, cool day. The overall colour is a bit drab but we’ve seen plenty of red to brighten things up. The jacket is beautiful and manages to be both casual and elegant. It is interesting that the jacket is made from 60% alpaca. Alpaca is many times warmer than sheep’s wool, as it is a hollow fibre. This gives good thermal capacity, that allows for a breathable fibre with insulating qualities. Therefore the item can keep a person warm, without being thick or bulky. I have an alpaca cape that is very cozy, even here in Canada, during the winter. I love this look on her. The color of the jacket is beautiful and the fit is fantastic. My only disappointment is that the jacket isn’t from high street or is more affordable. Almost $1,000 for a sweater that looks like it’s from Ann Taylor? Uh…no. Those earrings are just plain ugly in my opinion! The coat is Sentaler. Their coats are gorgeous. I know I’m in the minority, since it sold out already, but my first thought when I saw it was eww! I’m not against sweater coats–I own one myself–but the styling on this one is all over the place. The belt, the weird sleeves……not a fan at all. Lovely look for Kate and nice to see some different casual pieces. I adore the coat. The sleeves really set it apart. The boots make the whole look very appropriate for the setting / event and are also young and fun. Love the sweater jacket on Kate! Would love to purchase for myself but, the price is a bit high! So Kate channels Starsky & Hutch? Oh, these tie-belt cardigans were so popular in the 80s, after which I went off them completely. I found them too cumbersome to wear and the tie belt a pain, either the knot wouldn’t secure for long or the loose ends were left flapping around. It’s a style which inevitably suffers from too much bulk in more affordable yarns. Alpaca, of course, gets round that nicely. It’s such a dream to wear and hangs beautifully with fluidity denied those lesser yarns. It’s light and, of this quality, can be as ferociously warm is it is figure-hugging. Kate wears her Sentaler brilliantly as she alone can survive its naturally waist-thickening properties. Her cowboy boots are perfect and the local earrings are a lovely touch. It’s noticeable how her updo is becoming more flyaway later in the day. Possibly a riposte to those in our last post wondering why she would favour wearing a hairnet on occasion. I love this entire look. This is the type of outfit I would wear for casual wear—jeans tucked into either riding boots or cowgirl boots. I normally wouldn’t wear an updo but I think she simply left it that way due to time constraints and the fact that if it was windy it would stay out of her face. The sweater coat is gorgeous and I wish I could convince myself to pay $920 for it. I think the earrings were both lovely and appropriate and it was fantastic that she showcased a local young designer—I predict her website will crash from all the activity. My only (very tiny) quibble is that I usually wear black boots if I am going to wear black jeans and grey jacket because I don’t love mixing black and brown in that manner but I realize this is just a personal idiosyncrasy. Catherine’s hair down today (casual) would have made this look absolutely perfect. Love the ribbed sleeves of her wrap coat and the awesome boots. Kate looks lovely! I much prefer this to the red coat this morning. I love the casual elegance. I’d typically be critical of wearing such a formal hairstyle in a casual setting, but given the quick change and how it shows off the shawl collar and earrings, it works quite well for me. I love the coat. The ribbed sleeves and collar add interest without bulk. On the green coat from two days ago, it was mentioned that self belts are hard to make look nice because of their thick nature. I feel like the Duchess has succeeded in making it look nice here, partly because of the casual nature of the coat, partly because of the length of the ends being sufficient to weigh the knot down appropriately. I do find the boots paired with that jacket odd. I’m from the south and attend the Houston Livestock Show and Rodeo every year. It’s the second largest rodeo in the world next to the Calgary Stampede. When there, you see two types of people wearing cowboy boots: the people who farm and ranch for a living (true cowboys, you may say), and those dressing up for rodeo. Unfortunately, Kate looks like she is dressing up, and they are a costumy nod to the host country where her jacket and earrings are both so classy. Loved this look. Sometimes Kate looks a bit overdressed to me for outdoorsy things – see ‘wedges’ – but I thought today’s outfit was spot-on and she looked lovely. Appropriate, but casual. I don’t know about this look. The sweater-like jacket and hair in a low bun make her look older (in my opinion). The color/length of the jacket remind me of another one she wore in England, I think for an event with children. She wore wedge boots if I remember correctly. Booties would have looked super cute with this coat…and make her not look costume-y. Oh, I wish she had worn booties! The best thing about fall is sweaters and boots. They’re like comfort clothing. I envy that sweater coat, it looks so cozy. So happy to see her wearing a piece by Canadian designer Sentaler! I’m not crazy about this coat. It grew on me a bit as I saw more photos in the post – I think it looks the best in the photo of them walking along the tracks – but I’m not a fan of the tied belt. It reminds me too much of early 2000s fashion that I wore in my preteen years. I do like the collar though. 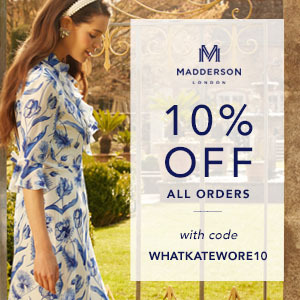 How exciting for that designer that Kate picked some of her earrings! I wonder if she picked them up while in Whitehorse, or if she (or someone on her team) found a jeweller from one of the cities visited on the tour well in advance. Also I went to Topshop in Copenhagen yesterday, thinking there probably weren’t enough Kate fashion followers in this city to cause the gingham shirt to sell out so quickly. Alas, I couldn’t find it – in fact, I couldn’t find anything gingham at all. It made me wonder if the shirt was never stocked there at all (it is a small store) or if the less popular stores have their Kate-worn items “recalled” or transferred to other stores or the online shop to keep up with demand. A+ look for me. It was the perfect balance of casual and elegance. This is a great look. It reminds me of my weekend uniform, lol – sweater coat, jeans, and tall boots. My price point is a bit different though 🙂 but I do love that sweater. Seeing her in the picture from 2011 made me think of how great she looks in bootcut jeans. I know skinny jeans have been all the rage for a while but it would be nice to see her in some bootcuts or flares again on some of these casual engagements. I had exact same nostalgic feeling liking at a picture of Kate from 2011 wearing “normal” jeans. Such a great look for her. I miss it! Love the way both William and Kate look, particularly the ribbing detail on the sleeves of her sweater. But I have to admit, the natural scenery took my breath away so focusing on the fashion was hard! Love that coat , pity my budget won’t let me get one. So nice to see her with her hair up more often. Well suited to the event. Don’t like the hair up in low bun idea tho. Hi Anna, I agree with you, this was a good moment to let her hair down… Or maybe tie it up in a ponytail? Looking at the short amount of time between the Whitehorse and Carcross events though, it may not have been a possibility with all that hairspray and hairpins… Overall, like you said, it was a nice casual look, well suited to the event. Ooops! I meant Hanna!!! So sorry about that! I think a ponytail could have worked here. Love the sweater coat, stylish but casual and a nod to a Canadian label — perfect. Nice earrings! Hope to see her wear them again when she gets back home! I love this fresh casual look on Kate. The sweater coat is lovely; it’s something I could see myself wearing. A pretty blue grey color, too. It makes a great centerpiece for a practical and comfortable outdoorsy outfit. I’d love to own that coat! I would too, but I am having trouble convincing myself to spend $900 on a sweater. It is gorgeous though. . . I found it a great relief to see both Kate and Wills in a casual look again, we’ve had a full share of formal this trip!